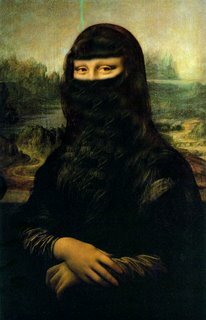 So, what do you reckon to La Giaconda – Islam style? We have seen the destruction of great works of art before. There is even a name for it “iconoclasm”. In Afghanistan, during the rein of terror by the Taliban they destroyed not only centuries old Buddha statues but also hundreds of priceless works of art all because they said they were un-Islamic. What other great works of art is threatened? Europe’s birth rate is declining at the same time immigration from Islamic countries is at an all time high. One day European nations may fall to Islam. We may very well see the burning of the Mona Lisa and the destruction of Michelangelo’s David because they too are deemed un-Islamic. We are setting the precedence now that art that is offensive to Islam is unacceptable. Are we willing to lose all we hold dear as the price for tolerance? It’s a fair question. Are we prepared to stand up for that which we hold? Is it possible for those of us who live in post-Christian western liberal democracies to come to terms with the brutal truth that freedom is not free. Have we the strength to repulse the threat from militant Islam that now circles the globe – or will we be the people air-brushed out of history? But she needs more lashes and kohl. The real-deal Arab eyes are usually more alluring. I also understand some musical instruments are even offensive to Islam. Is there any truth in this? Damn David she still looks mighty fine. That niqab just makes women look even more desirable. Probably. I reckon it’s just a matter of time before a couple of Muslims with big beards turn up on ‘Dragon’s Den’ and try to blag a grant for their new invention; ‘the Burka periscope.’ That way they can complete the black sheet effect and the unfortunate lady can still (just about) see where she’s going (assuming her male relatives haven’t already told her). « FRANCE SAYS NO TO THE EURO…!